Today, when you think of ‘Sydney’s Tallest Building’ you probably think of Sydney Tower (which many remember by the name of Centrepoint). 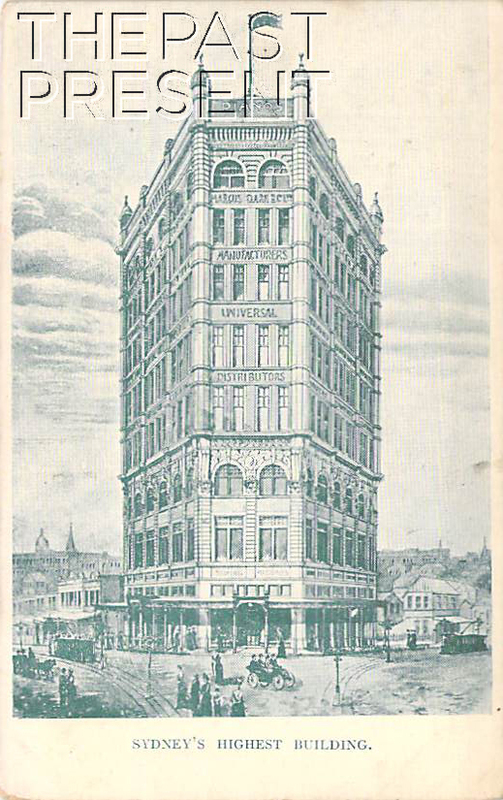 A nine storey building like the one shown in this postcard would certainly not rate a mention today, but at the time the postcard was printed, this was a landmark building, the tallest in Sydney, dominating the skyline. It was of course The Marcus Clark Building. Marcus Clark and Co was an Australian department store chain, one of the largest and most successful in Sydney. Their first store opened in Newtown in 1883 when Henry Marcus Clark purchased a drapery business from John Kingsbury, his former employer. Soon the department store chain was growing in leaps and bounds with shops opening in Marrickville and Bondi Junction. It was not until 1896 though that a store was opened closer to the city itself. In 1896 a new store opened near Railway Square, on the corner of George and Harris Streets. Where Marcus Clark and Co had been seen as expensive and exclusive stores elsewhere, this new shop was given the name Bon Marche (referring to the Paris department store and a store in Liverpool, England where Clark had been apprenticed) and sold less expensive wares. So successful was this shop that in 1909 the original shop was demolished and a new, larger building was constructed to house the business. The success of the shop also encouraged Clark to open other shops around the city. One of these shops was to become a landmark building in itself. In 1906 a new building to house the store was constructed at Central Square. The building was designed by James Nangle and modeled on New York’s Fuller Building (better known as The Flatiron Building). The Marcus Clark Building was one of Sydney’s earliest skyscrapers, towering over the city skyline. With nine storeys, standing at 150 feet in total height it was Sydney’s tallest building and would have been clearly visible to all visitors to the city approaching from the South. Today the building, still known as The Marcus Clark Building is home to the Sydney Institute of TAFE. This entry was posted in New South Wales, Sydney and tagged 1900s, buildings, commerce, entertainment, industry, postcard collection, sydney.